Ho Chi Minh (Vietnam) – May 17, 2013 – Park Hyatt Saigon and George V Records, Buddha-Bar Music Label and Distribution Company, will be hosting Buddha-Bar XV, “A Chill Wind from Russia,” album release party on 29 June 2013 at 9 pm in 2 Lam Son Bar. Buddha-Bar’s current resident mix-master, DJ Ravin, will be spinning and making his first guest appearance in Vietnam flying in from Paris. An entrance fee of 1.000.000 Vietnam Dong, which includes one drink, will be a nominal fee to witness the global success of yet another Buddha Bar original. Officially released on 29 April 2013, Buddha-Bar XV, “A Chill Wind from Russia,” captivates its listeners to the sweet sounds of Russian traditional instruments and vocals. An emblematic and mysterious country, Russia offers a wide array of cultural facets where DJ Ravin creates a mesmerizing atmosphere. The first CD focuses on acoustics to represent Russia’s grassy plains, featuring artists like Bliss, Yasmine Hamdan and Thor. The second CD infuses more electronic music to embody the warm nights with artists such as Dim Vach and Seanbay. Created in 2000, the George V Record label has successfully produced a collection of 14 Buddha-Bar CD compilations. Its musical identity demonstrates an innovative and avant-garde aspect thanks to the subtle mixture of enchanting Electro-Ethnic rhythms and tribal sounds. Always seeking new melodies and rhythms that are filled with colourful vibes, DJ Ravin contributes to the concept’s unique musical signature and shares his own imprint to the world. His fame rapidly grew in Paris nightlife enabling him to play in legendary celebrity haunts, such as the Rex and Les Bains Douches. Under his guidance, numerous singers and musicians have produced original musical stylings, which are widely acclaimed by the international public. Today, the label is asked by prestigious brands like L’Oréal, Salvatore Ferragamo and Cartier to create albums that accurately reflect their image. George V Records acts as a precursor for this trend in musical branding and remains as the leader in the industry. For reservations and enquiries, please email moc.ttayh@uul.neyugn or call +84 8 3824 1234. To learn more about Park Hyatt Saigon news and events, please visit our Dining and Entertainment website, www.restaurants.parkhyattsaigon.com. Park Hyatt Saigon, a 244-room hotel, is a central landmark in Ho Chi Minh City, located within walking distance to the business district and various cultural and historical sites. It features French colonial inspired rooms; a pillar-less ballroom with a drive-in vehicular access; two award-winning restaurants – Opera, serving Italian cuisine and Square One, serving Vietnamese seafood and Western steak. The hotel is also host to 2 Lam Son, the contemporary bar known for its stylish ambiance and signature cocktails, and Xuan Spa, the tranquil retreat set amidst a tropical garden and an outdoor pool. 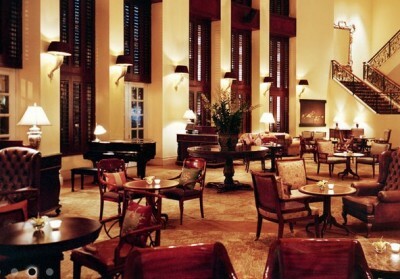 Reservations for Park Hyatt Saigon may be made by calling +84 8 3824 1234 or visiting www.parkhyattsaigon.com. Intimate and residential in style, Park Hyatt hotels promise gracious service on a personal scale. Located in many of the world’s premier destinations, each Park Hyatt combines elegance with distinctive regional character. Park Hyatt hotels feature sophisticated interiors, meeting and special event spaces for small groups and social occasions, critically acclaimed art programs, and signature restaurants featuring award-winning chefs. For more information and reservations, visit www.parkhyatt.com.